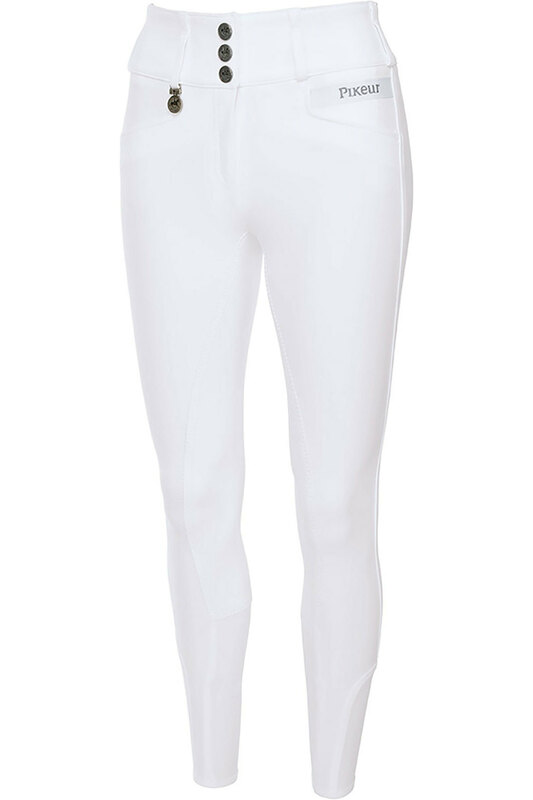 Do you love the look and style of Pikeur’s Candela high-waisted denim breeches for everyday riding wear? How about retaining the wow factor, but in Pikeur’s premium 4-way stretch 79 fabric? Meet Pikeur’s Candela breeches. The Prestige-Micro 2000 Plus cotton/microfibre blend + 79 fabric is one of the most advanced elastic materials available and it’s perfect for competition wear. That makes the Candela breeches top-level performance wear that gives you all the stretch and comfort you need in the arena. They also take the lead when it comes to style, with stitch detailing, front slant pockets and the wide belt loops that are a chic signature of Pikeur design. What’s more, the knee patches are in great-looking McCrown™ synthetic leather, which helps you to grip the saddle too. They’re decorated with a subtle embossed Pikeur logo. These high-waisted breeches are so flattering and comfortable to wear, whatever your equestrian discipline. Plus, their glamorous design creates the unmistakeable feel-good factor that boosts your performance confidence when competing. Customers are responsible for the cost of return. More details.